Welcome, finally, to the World of Pokémon. Pokémon Red starts with a short cinematic battle and a title screen. A few of the creatures waiting inside scroll past the screen, prompting the pressing of the Start button. Selecting new game brings up the face of Professor Oak, introducing the “World of Pokémon.” The idea of Pokémon thriving in the day-to-day of the world around players was always the big narrative hook of the Pokémon franchise, and as Professor Oak explains, Pokémon are meant to serve all kinds of purpose in this world. The player, however, would simply capture some for study and battle with others. Eventually, the player, canonically called Red, would become the best at this task, and the game was done. Pokémon has compelled me with this concept for twenty years, always adding new creatures and obstacles. More Pokémon plush live in my office than I should admit. I even stuck out Rattata catching simulator Pokémon Go longer than I wanted. I’m compelled because I want to believe in the World of Pokémon. Pokémon Sun does not begin with a cinematic and a title screen. I am prompted to select a language, and once I do, the game immediately flares to life. A video call is started with the new Professor, Kukui. Kukui begins to expose information, not unlike Professor Oak’s role. Things are different this time, however. Excitement is shown across Kukui’s face as he emotes through his dialog. When he opens a Poké Ball, a living Pokémon appears and tries to shove its face in the camera. After selecting the trainer’s face (thankfully, there’s even more skin color options), players are taken away from the conversation to an introduction to the story of the game that doesn’t include the player quite yet. That might not sound innovative, but it’s a major departure from the standard execution of events and is only the beginning of the changes at hand. For the first time in twenty years, Game Freak and the Pokémon Company have decided to look back on the franchise juggernaut and actually change fundamental ideas about what makes up the core series. For a series that old, of course there have been changes and refinements, but nothing that feels like the changes applied to Sun and Moon. The changes here feel less like better versions of what’s come before, but a response to that legacy. Again, twenty years is a very long time and a game released on that anniversary should be confident in facing its own legacy. I do have my own theory, however. Competition showed up. The massive presence of Yo-Kai Watch in Japan and a push into the West just so happens to coincide with the development of Sun and Moon to a point where I feel like it must be addressed: the king of the castle got spooked. Not a moment too soon, as it turns out. Pokémon Sun and Moon choose to double down on the idea that players should be experiencing an actual world instead of a facsimile of one. This idea drives both the new plot and all the new mechanical changes in the games. First and foremost, the 3D presentation first used in X and Y is reapplied with far more zealotry. 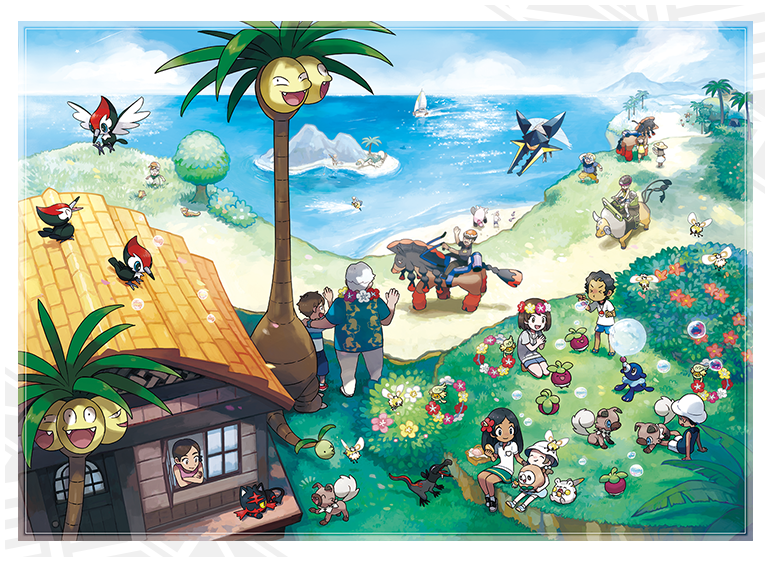 Where the Kalos region offered a beautiful environment with scaled down characters, Alola is populated with properly scaled models. A huge advantage to this is that Pokémon finally can be seen as a part of the game’s overworld as opposed to being regulated to side glimpses and random encounters. Machamps are seen assisting in construction, your character’s mother keeps a Meowth at home for company, new creature Pyukumuku wash up on the shore lines, and there is so much more. 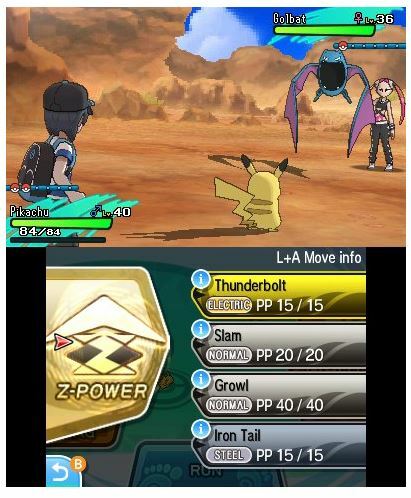 Players aren’t left out of the fun either, in what is easily the best innovation offered to the series: a group of Pokémon can now be called upon for travel and other in the field tasks; which eliminate the need to have specific moves on your own team to progress. These rented Pokémon are gloriously rendered alongside the rest of the world and once again lend themselves to the legitimacy of the world this time around. To put it in comparison, Pokémon Red and Blue was incapable of rendering specific creatures of various designs in its overworld, relying instead on catch-all sprite images. Also, there were five moves required to be on hand in order to actually progress in the game (although, if you were someone like me, you could tough it out through Rock Tunnel without having to use Flash.) Those moves could not be replaced with other moves, because they’re essentially required to reach the end game. At the risk of sounding anecdotal: if seven year-old me, someone who was known for having his own party of Pokémon made out of his toys and tended to be more friendly with them than people, got a look at Sun and Moon, I don’t know if he’d believe it. Newcomers or lapsed fans with revived interest will find joy in this visual shift as well, as characters are now allowed to travel outside of the previous titles 8 way run, removing even more of the familiar in favor of what works better today. These attempts to create a real world extend into the main game mechanic of battle as well. Player characters are now always visible in battle; which is made better by the return of player customization (pro tip: one of the game’s best shirts are available to you from the start of the game) that allows for quite a bit of diversity. The battlefields also drastically change based on the location and help create some pretty cool views. While battles are still in their turn based forms with four moves each as always, there have been some mechanical changes. One is the heavily advertised ‘Z-Moves,’ special moves that can be performed by any Pokémon. These moves are performed as over the top versions of an existing move in that Pokémon’s pool. 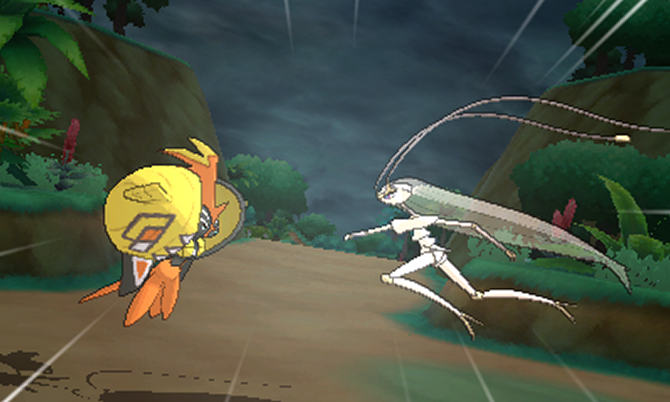 When used, a Z-Move is executed in a short cinematic-not unlike what might be found in a Final Fantasy or Paper Maro game. Z-Moves are entertaining and can help out in the main game when in a bind (pro tip #2: get that Munchlax that’s available until mid-January for the best one), but they don’t really add much more to the game, at least not in the way Mega Evolution did for the X and Y series. From a mechanical perspective, battles haven’t changed much either. 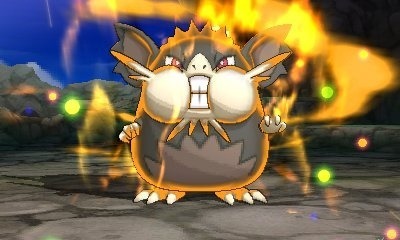 Though, Game Freak saw fit to make some tweaks to address long-standing pain points. The bottom screen of the console is still dedicated to inputting commands, but the options have been moved around to allow for more information to be provided to the player. Small sprites of the Pokémon in battle are now dead center, and they can be tapped for information such as status changes and ability descriptions. Attacks and items also come with descriptions that can be opened. Veteran players might not need these kinds of features, but for lapsed or new players, this is a huge help in managing the growing list of moves and techniques. (Pro tip #3: double check items, because a bunch of classic items did change.) Difficulty also tends to come up in discussion of Pokémon games, though I’ve never really understood why. As the battle mechanics of the games do get complicated enough later on to have a thriving competitive scene, the core of the Pokémon has always seemed to be intended to be simple to learn and master for its intended audience in a “My First JRPG” kind of way. That’s how it was for me as a child, anyway. Even so, the game does see a change in how difficulty works, even if it isn’t exactly hard. Gyms in the game have been replaced with different trials that have strong Pokémon waiting at the end of them. These particular Totem Pokémon will have special boosts and even items that will give even more seasoned players a moment of pause. Despite their tricks and boosts, I never lost a Totem match, so I cannot say things are more difficult. I will say the tweaks made those battles more enjoyable as a challenge, though. Had to censor a bit. Other features of the game offer respite from battle. The aforementioned trials rarely take the form of successive battles, like the gyms in the past games did. These trials often take advantage of the environments they’re held in, meaning that the game world is directly integrated into the gameplay. You might have a task to find ingredients to make food for the Totem Pokémon or investigate spooky goings on in an abandoned supermarket, for example. Some trials might come off as silly, but I truly enjoyed the shift in perspective and the unique nature of each trial gave personality to the trial’s giver. In fact, personality is another strength to Sun and Moon as a whole. The 3D environment lets characters appear differently from style to style, and many who play a role in the plot are allowed to grow and have arcs to themselves. Plus, for the first time in the series, an adorable Pokémon named Cosmog is allowed to be a character that tags along for the story as opposed to existing as a plot device. There’s nothing going on here that can’t be figured out by anyone capable of paying attention (or watched any anime before, ever), but I never found myself bored with the trappings of the franchise. I would attribute that again to the desire to finally interlace everything to the game world. In Pokémon Red, the plot of the game usually would just happen as the player stumbled into it while hitting milestones. In Sun, the plot, the island challenge, the legendary Pokémon on the box, and more are all tied together organically. This even extends to the designs of the Pokémon themselves. Newer creations often have lore tying directly into Alola’s history and are not afraid to be bold. Game Freak also decided to overhaul classic Pokémon from Red and Blue with new forms, typings, and more. Chances are you’ve seen a couple, like the palm tree Alolan Exeggutor or surfing Raichu. Others are even more surprising, such as changes to lesser used Pokémon like Rattata and Diglett. There is a bit of fun to be had discovering both new and old-as-new. Those that have criticized Pokémon designs in the past can know that those criticisms have been heard and responded to in the form of the mysterious Ultra Beasts. 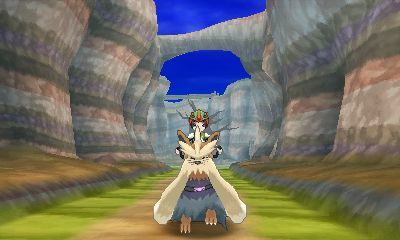 The Beasts feel like a deliberate “Oh, really?” from Game Freak. You can look over all of these in glorious 3D using Pokémon Refresh. Pokémon Refresh is an updated Amie from X and Y that throws out the mini games and focuses simply on maintaining Pokémon throughout the game. 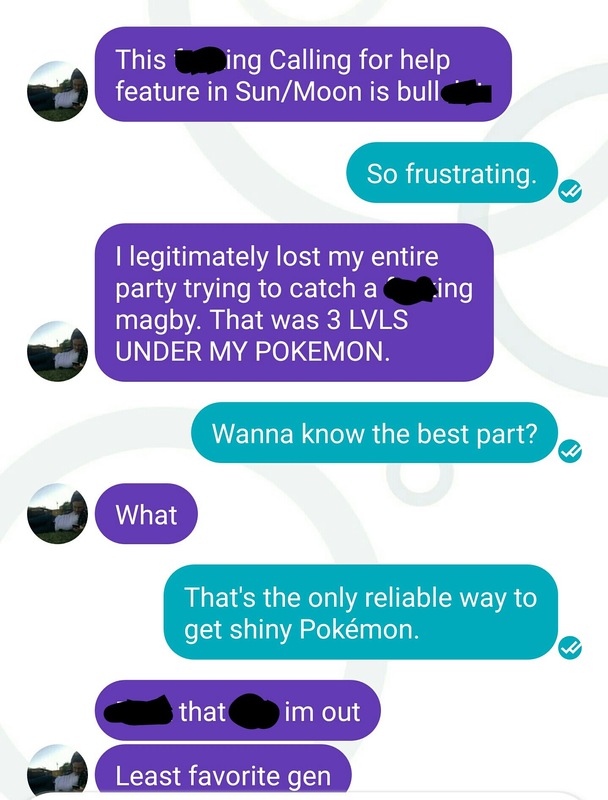 Some may find it tedious to clean mud or dirt off their partners, but I really thought that it gave my particular Pokémon something worthwhile besides statistics. Plus, spending time in this mode can actually give modifiers in battle, increasing critical rates and even saving Pokémon from fainting. Seriously, seven year old me loves that. Not everything manages to hit the mark, unfortunately. Pokémon picture taking finally makes a return to the franchise, but the implementation is an afterthought that has little impact on the rest of the game and can only be turned on in designated locations. There is little challenge or enjoyment in that experience. All online features have be regulated to a new system called Festival Plaza, a location that features a castle and little shops that is meant to act as a hub for online players. Shops can be upgraded and changed through fill-in-the-blank player interaction that doesn’t feel personable. Your mileage is going to vary on how much you use this, but for me it simply exists as the menu I need to open in order to trade my wife (who played Moon) her beloved Alolan Vulpix. Finally, there’s Poké Pelago, something that should be better than it is. In Pelago, the Pokémon not currently being used in your party can hang out, hunt for items, grow berries, and even level up while you continue playing. On paper, this is great, but the only part of Pelago that pans out is the berry growing. Leveling other Pokémon on the side is slower than just stopping and grinding, item hunting is inconsistent, and the rest don’t feel too impactful on actual gameplay. It was a nice idea, but feels half realized. Oh, and for those of you wondering, there is some post game content, but not nearly enough for most to be satisfied. Pokémon has come a long way in twenty years, and not just within its own main series. There are plenty of fans of the show, Go, the anime, trading card games, and more. Sun and Moon truly feel like the best effort yet to try to combine the greatness of all of these together while taking the series forward. It’s definitely low reaching berries going for this, but what we have on our hands is a true evolution of the franchise. What was only a pipe dream of building a truly engrossing world needing exploration and discovery in Pokémon Red and Blue has finally taken form in Pokémon Sun and Moon, and the games are much better for it. Seven year old me is so happy.